NMR is a unique and versatile spectroscopic method capable of measuring all protons in a sample. Chemometrics is a multivariate data analysis field using statistics to compute models for extracting chemical information from large two-dimensional multivariate data sets. A ternary model design with three simple linear water soluble alcohols containing different amounts of hydrocarbons with highly overlapping resonances have been measured by NMR spectroscopy. Using this design we can explore subtle differences in the methylene peak. Spectral assignments in this region have been limited by the extensive chemical shift overlap and by the broadness of the signals. Similar spectral problems may be encountered in organic or pharmaceutical samples when identifying impurities that mimic the compound of interest. 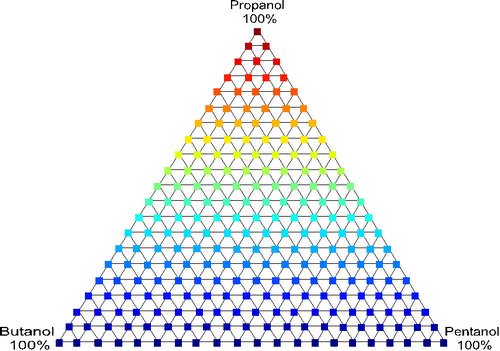 The experimental design is a ternary design of mixtures of the linear alcohols: propanol, butanol and pentanol. Each alcohol component (50 mM) has 21 concentration levels in increments of five from 0% to 100%. 1H NMR spectra were recorded for each of the 231 mixtures on a Bruker Avance Ultra Shield 400 spectrometer. H. Winning, F.H. Larsen, R. Bro, S.B. Engelsen, Quantitative analysis of NMR spectra with chemometrics, Journal of Magnetic Resonance 190(2008)26–32.